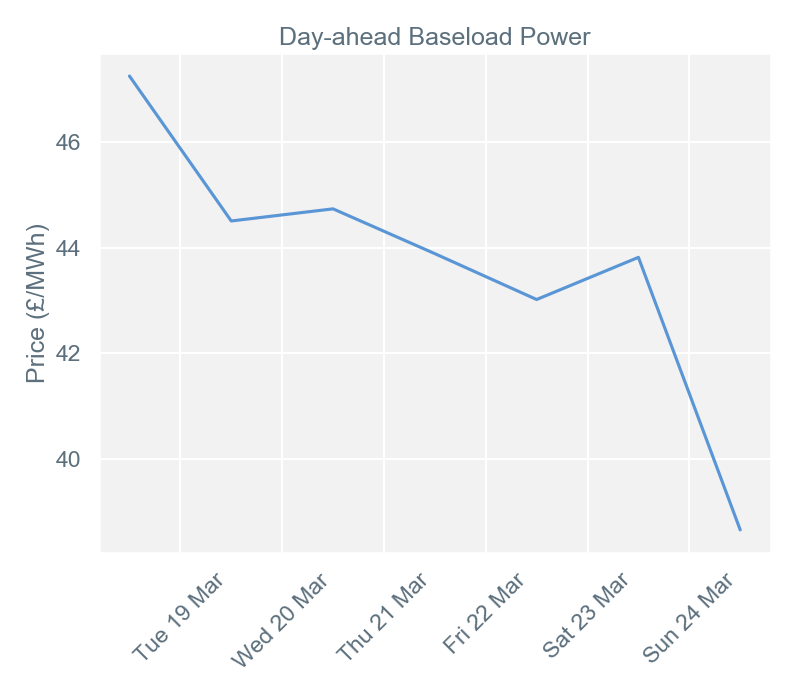 Day-ahead baseload power prices averaged £43.68/MWh during week 12, down £0.37/MWh from last week and the lowest weekly average for 2019 so far. The week’s highest price of £47.18/MWh was for Monday 18th March, thanks to extremely low levels of wind generation (on average 3.2GW for the day). This forced more expensive forms of electricity generation into the UK’s energy mix. 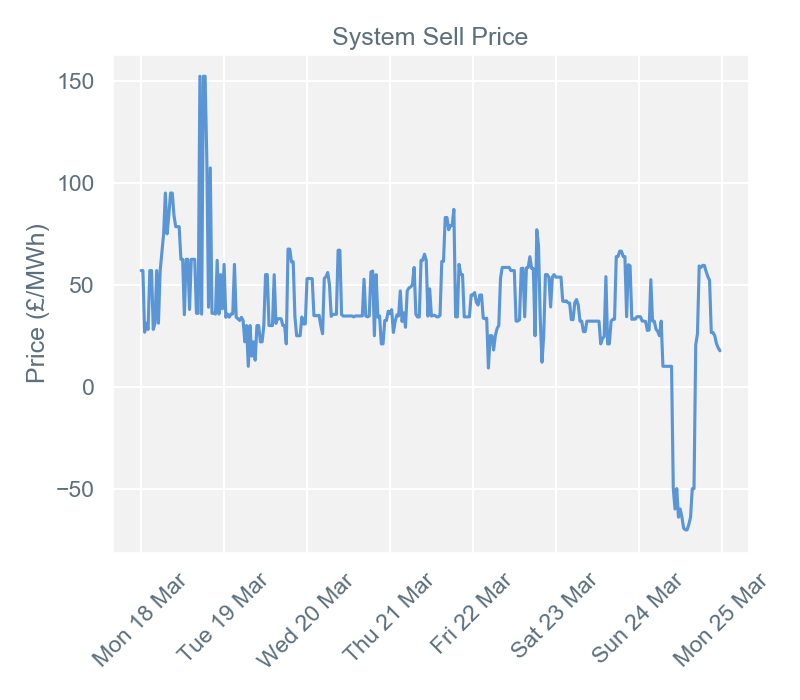 The week’s lowest price of £38.76/MWh was for Sunday 24th March, which was an unseasonably sunny day. This was also the lowest price of the year so far, beating the previous record of £40.96/MWh set on Sunday 9th March. Generation from solar typically acts as a suppressor of power demand and the mild temperatures reduced demand on the system even further. These factors, combined with relatively high wind output, meant that gas output was reduced to just 17.8% of the UK’s generation stack when solar output peaked at 1pm. Settlement periods 35 (17:00 – 17:30), 37 (18:00 – 18:30) and 38 (18:30 – 19:00) on Monday 18th March all shared the highest imbalance price for week 12 of £152.30/MWh. 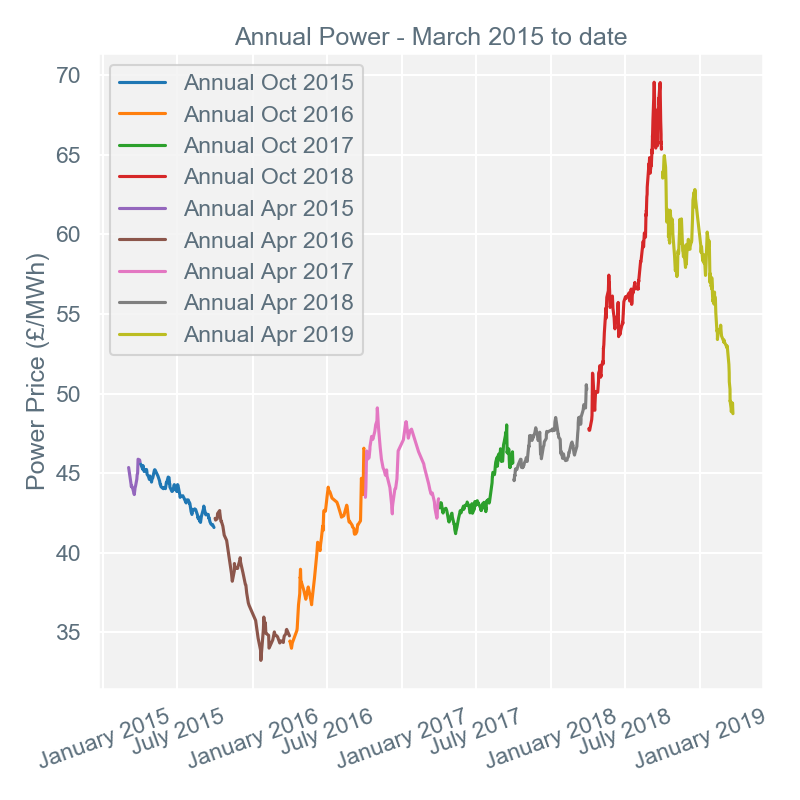 During these periods, demand was gradually increasing while renewable generation was below 3GW and set to decrease. This forced National Grid to look for more expensive alternatives, setting the final price by accepting Ratcliffe power station’s offer to increase generation through the use of coal. Settlement periods 28 (13:30 – 14:00) and 29 (14:00 – 14:30) on Sunday 24th March both shared the lowest imbalance price for week 12. These periods were within a long stretch of negative imbalance prices from 10am to 4.30pm. During this time, wind and solar output was exceptionally strong, forcing gas down to under 19% of the generation mix. The final price of -£70.24/MWh was set by accepted bids from Harestanes wind farm to reduce generation. Week 12 saw high renewable output, but also large swings in wind generation. These ranged from lows of under 2GW to highs that broke through the 10GW mark on 22nd and 24th March. Wind generation peaked at 13.1GW on Sunday 24th March, where it reached 39% of the UK’s energy mix. This peak alone was just over double the week’s average of 6.5GW, highlighting how unpredictable wind levels were during week 12. 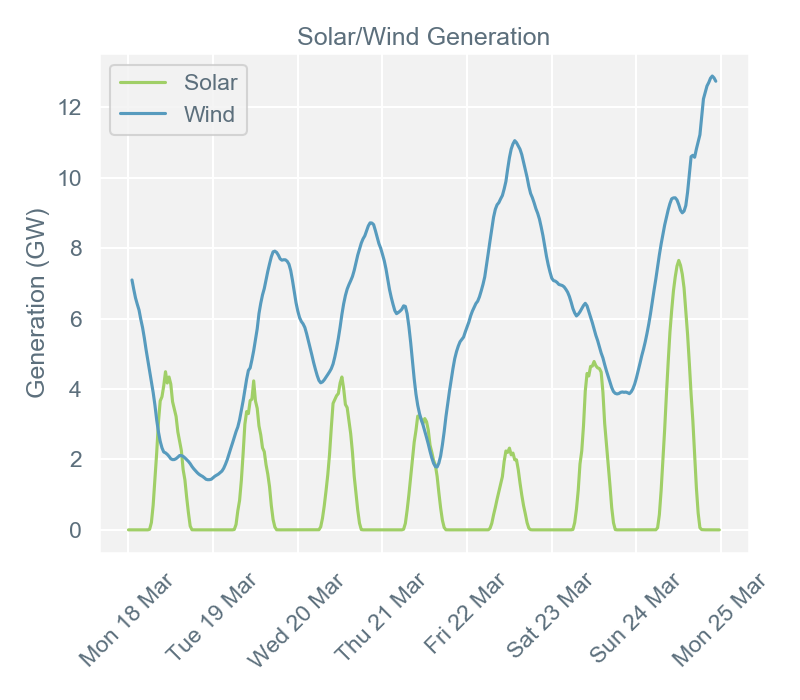 Solar was relatively strong, reaching over 3.5GW on five out of the seven days; it peaked at 7.7GW on Sunday 24th March (22.5% of the UK’s energy mix). Put together, these two weather dependant sources of energy peaked at 17GW on Sunday 24th March, where they reached 49.8% of the UK’s energy mix. Secure and promote* (Seasons +1, +2, +3, +4) baseload contracts offered little direction during week 12, losing on average just -£0.18/MWh. The week started on a bearish note on Monday 18th March, with trade on the European carbon market providing downward impetus. By the end of that day, the Dec-19 EUA benchmark product was trading around €1/tCO2e (tonnes per carbon dioxide equivalent) below Friday’s settlement. This downward trend continued into Tuesday, where the Dec-19 benchmark product shed another €1/tCO2e compared to Monday’s closing price. Wednesday was the only day that ended on a bullish note, when the front month Brent Crude Oil benchmark ended up $1/bbl by the close of play. Thursday saw the bearish trend return with wholesale power contracts tracking the weakness on the National Balancing Point (NBP) gas market, due to the fuel’s importance in the UK’s generation mix. 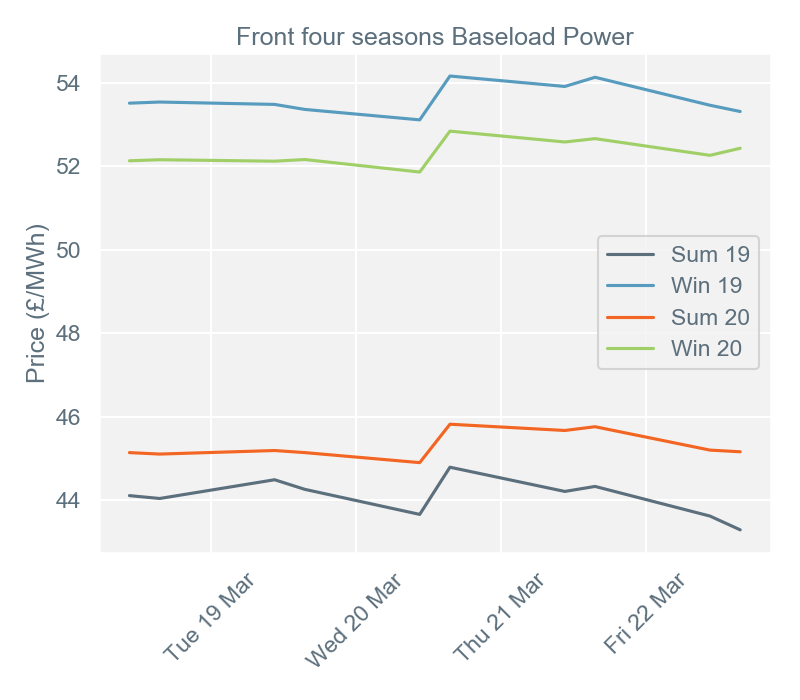 On Friday, the front two seasons (Summer-19 and Winter-19) baseload contracts dropped by around £1/MWh due to volatility from the Brexit deadline extension. The annual power graph shows how the value of an annual power contract changes over time. The annual contract value is the average of the front two seasons, currently Summer 19 and Winter 19. Report written by Thomas Stebbings and Ben Symonds, Haven Power’s Portfolio Analysts. To speak to them, or the rest of our Flex & Portfolio Management team’s analysts, on 01473 707755 quoting reference HP250.